Michael George, established as one of Britain’s most versatile bass-baritones, was a chorister at King’s College, Cambridge under Sir David Willcocks. He studied at the Royal College of Music, where he was a major prize-winner. He has appeared with all the leading UK orchestras and ensembles, has sung throughout Britain at all the major festivals and venues and has performed extensively abroad. 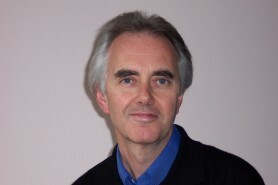 Michael has worked widely as a recording artist, and releases include The Dream of Gerontius, Messiah, Bach’s St. Matthew Passion and St. John Passion, Schubert’s Mass in A Flat with Sir John Eliot Gardiner, Boyce Odes with the Hanover band, Bach Cantatas and Masses with King’s College Cambridge and Stephen Cleobury, numerous recordings with Harry Christophers and The Sixteen, the complete Purcell series with Robert King and The King’s Consort and much music with Philip Pickett and the New London Consort, including Monteverdi’s Orfeo. Performances have included Bach’s St Matthew Passion with David Hill and the Bach Choir, Purcell’s Fairy Queen in The Netherlands, Cherubini Requiem with Muti, Elgar’s Apostles and many other works at the Three Choirs Festivals, Beethoven’s Missa Solemnis with the Halle and Mark Elder, Beethoven’s Ninth Symphony with Sir Neville Marriner in Brisbane and major tours of Handel’s Messiah with Christophers and The Sixteen in Europe and Japan. He has sung Mozart’s Requiem Mass with the Vienna Philharmonic and also with the San Francisco Symphony Orchestra and Bach’s St John Passion with the Orchestra of the Age of Enlightenment and the LPO. Recent engagements and future plans include L’Enfance du Christ in Denmark, Handel’s Saul in Holland, a tour of the St. John Passion with the Irish Baroque Orchestra, Commendatore in Don Giovanni in Moscow, Riccardo Primo in Basel, Semele and Fidelio for Scottish Opera, further performances of Orfeo all over Europe for Philip Pickett, Messiah in Aarhus, Paris and with the RLPO, Haydn’s Seasons with St Louis Symphony Orchestra, Mozart’s Requiem with the Bach Choir and concerts in Montreal. Bach’s St. John Passion in Milan and Haydn’s Creation in Israel. He sang Aeneas in a new Jonathan Miller production of Purcell’s Dido and Aeneas in several European countries in 2008 and 2009. In 2010 he performed Acis and Galatea in many European cities with Philip Pickett. He also performed in a new production of Purcell’s Fairy Queen in several European countries in 2011, again with Philip Pickett and The New London Consort.